One-hundred-fifty years ago this October, men began to gather each weekday at 5 p.m. in an old church building downtown, reciting texts and absorbing lessons from learned elders. But the exercise was less church than state: it was the opening session of what is now the capital city's oldest school of law. 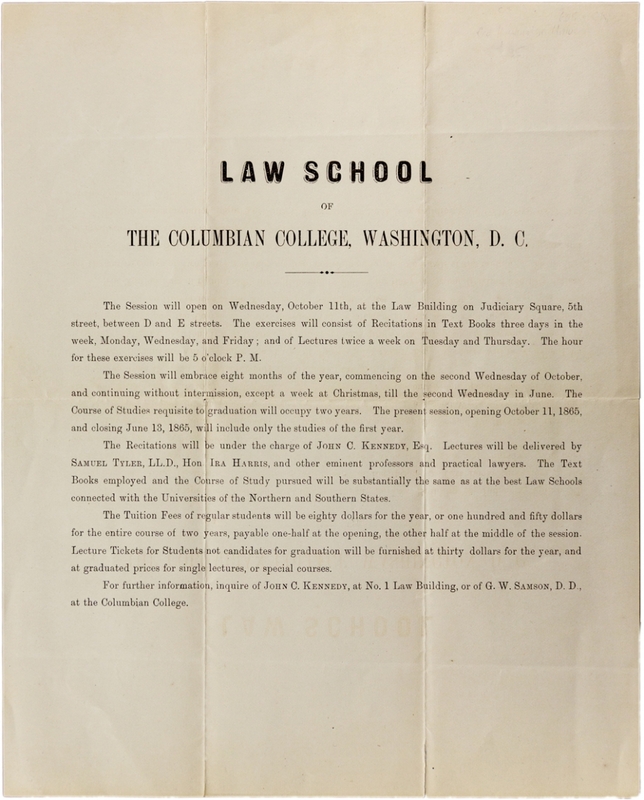 It all began with an 1865 flyer promising an education on par with the best law schools of both "the Northern and Southern States." (The Civil War had only ended that spring.) The artifact returned to GW Law just in the past two decades or so, after a book dealer in San Francisco found it tucked inside a volume, says Scott Pagel, director of the Jacob Burns Law Library and a professor of law. Two years later, degrees were awarded to the school's first group of 60 graduates, who hailed from 22 of the then 37 states. In the years since, the law school became a place where the inaugural course on patent law, in 1891, was taught by the U.S. Commissioner of Patents; where justices of the U.S. Supreme Court stop by to judge moot court competitions; and where students-for a class project-brought a civil lawsuit against former Vice President Spiro Agnew over alleged kickbacks, which forced him to repay nearly $270,000 to the state of Maryland. For more on GW Law’s celebration, visit law.gwu.edu/.